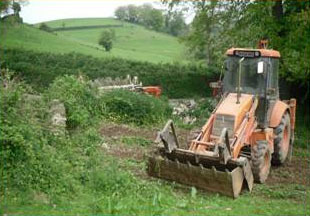 Bearscombe Farm ~ Kingsbridge, Devon. 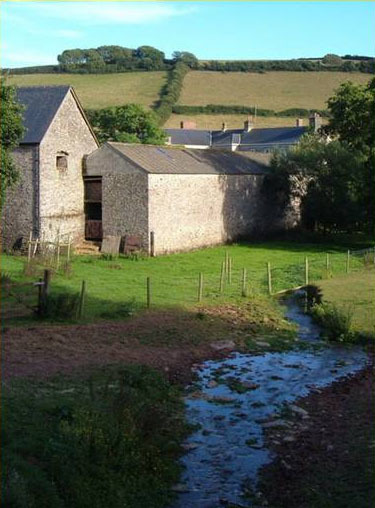 Bearscombe Farm is situated in an area of outstanding natural beauty in the Bowcombe Valley one mile outside of Kingsbridge in South Devon. 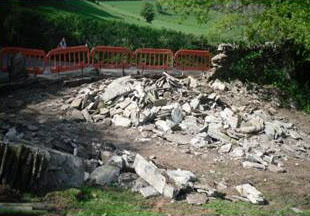 The farmhouse we see today dates back to about the 16th century and is built over the remains of a previous mansion that may possibly date back to the 13th or 14th centuries. 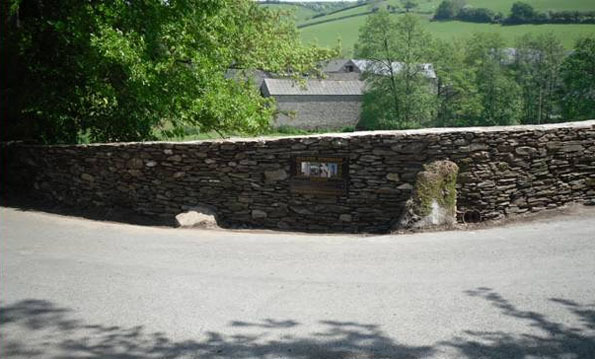 Originally called ‘Woodmanston’ before the 17th century, which relates to ‘Wodeman / Odeman’ who held the manor of Buckland in 1068, it was renamed Bearscombe after Justice Beare who resided here in the 17th century. 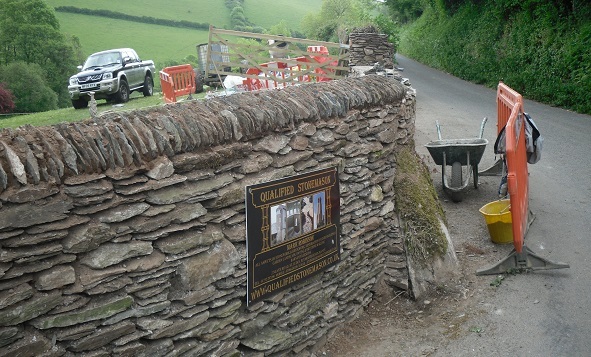 The farmhouse and out buildings are all Grade II listed. 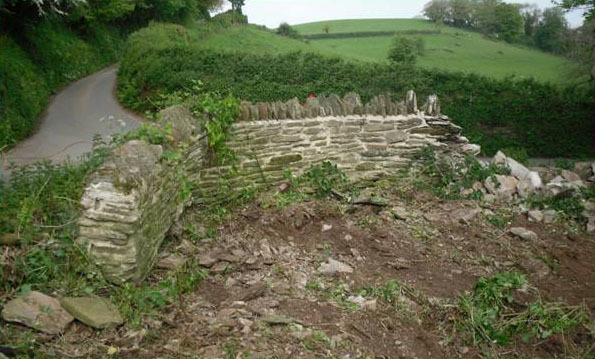 During icy road conditions a milk tanker crashed into a curved section of the field boundary wall causing extensive damage. 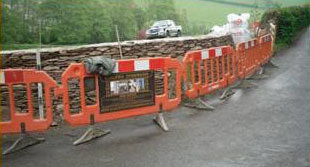 Road safety barriers were set up, a J.C.B. was brought in and the site cleared. 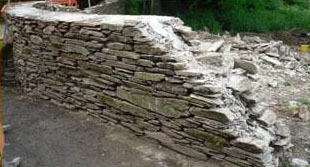 The existing stone was set aside for re-use. 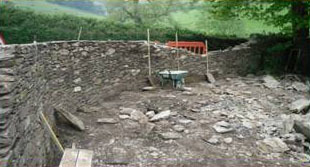 We then started work on re-building the wall. 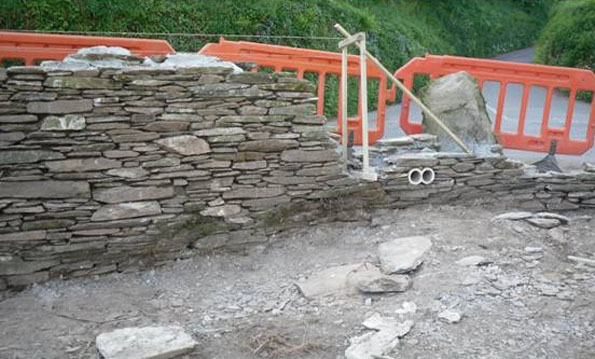 The section of wall that was removed had been repaired a few times over the years and consisted of several different styles of stonework by various masons. 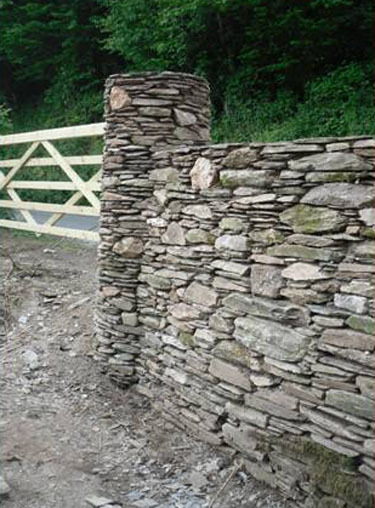 We found a section of original walling along the existing field boundary and set out to replicate that style. 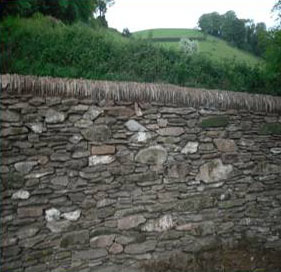 These walls were at least 300 years old! 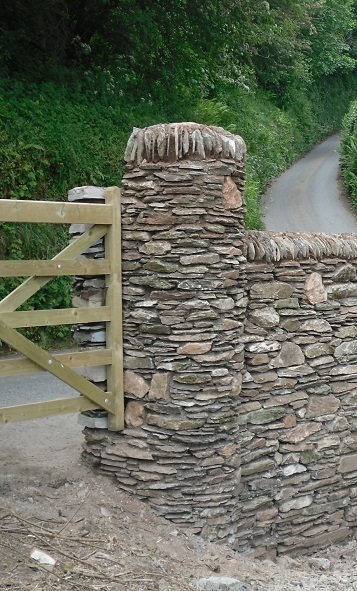 We used a traditional hydraulic lime mortar to build the wall, leaving the joints free of mortar to give the effect of a drystone wall, this gives it extra strength and matches into the existing field boundary. 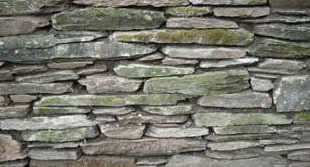 This method of construction is known as ‘Dry-Stack’ walling. 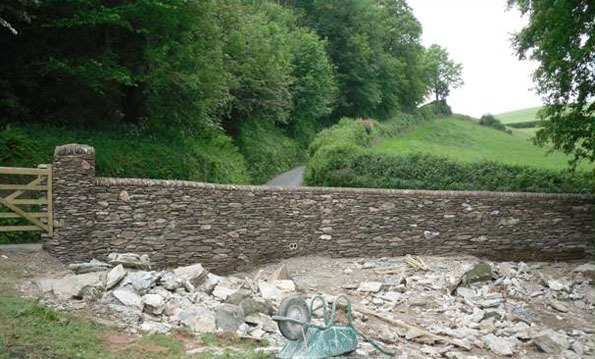 Batter frames were used to mirror the profile of the existing wall as it was wider at the base, and narrower at the top. 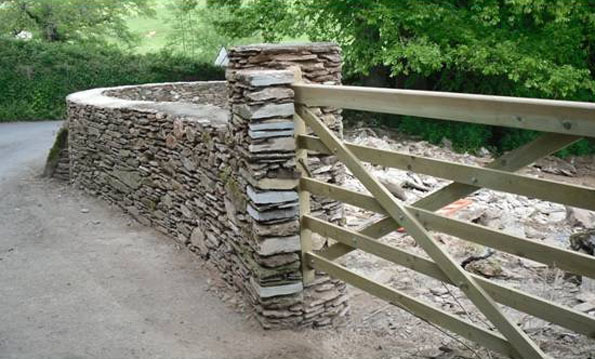 To finish off the end of the wall we constructed a circular pier and fixed a new wooden gate to form a larger entrance into the field. The pier is constructed with a protruding nib. 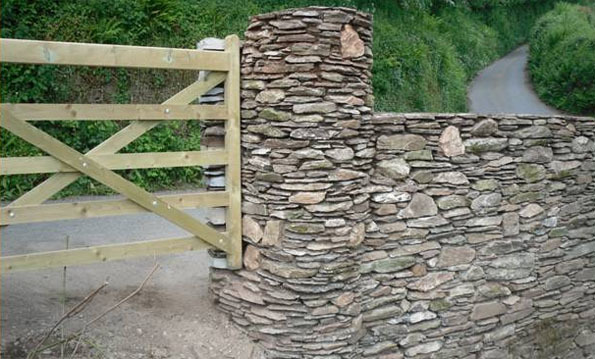 This makes it impossible for livestock to push the gate outwards into the road. 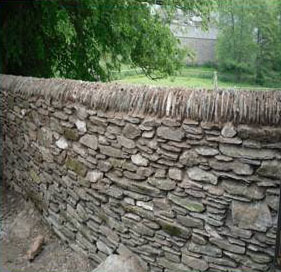 The ‘half-round’ coping along the top of the wall was then laid to match in with the original. 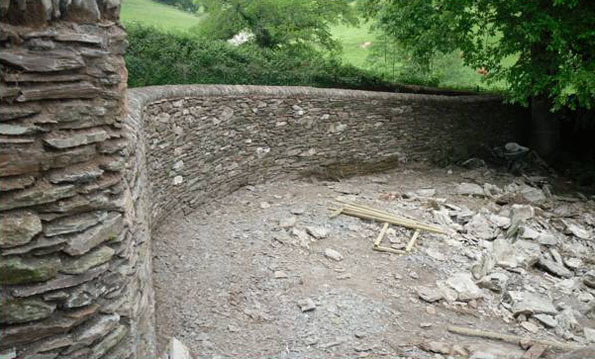 The capping was put on top of the circular pier in the same style as the coping.